Endocarditis is an inflammation of the inner layer of the heart, the endocardium. It usually involves the heart valves. Other structures that may be involved include the interventricular septum, the chordae tendineae, the mural endocardium, or the surfaces of intracardiac devices. Endocarditis is characterized by lesions, known as vegetations, which is a mass of platelets, fibrin, microcolonies of microorganisms, and scant inflammatory cells. In the subacute form of infective endocarditis, the vegetation may also include a center of granulomatous tissue, which may fibrose or calcify. Bartonella henselae bacilli in cardiac valve of a patient with blood culture-negative endocarditis. 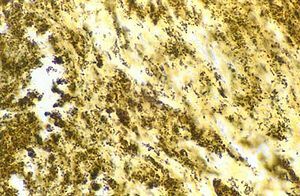 The bacilli appear as black granulations. There are several ways to classify endocarditis. The simplest classification is based on cause: either infective or non-infective, depending on whether a microorganism is the source of the inflammation or not. Regardless, the diagnosis of endocarditis is based on clinical features, investigations such as an echocardiogram, and blood cultures demonstrating the presence of endocarditis-causing microorganisms. Signs and symptoms include fever, chills, sweating, malaise, weakness, anorexia, weight loss, splenomegaly, flu-like feeling, cardiac murmur, heart failure, petechia (red spots on the skin), Osler's nodes (subcutaneous nodules found on hands and feet), Janeway lesions (nodular lesions on palms and soles), and Roth's spots (retinal hemorrhages). Infective endocarditis is an infection of the inner surface of the heart, usually the valves. Symptoms may include fever, small areas of bleeding into the skin, heart murmur, feeling tired, and low red blood cells. Complications may include valvular insufficiency, heart failure, stroke, and kidney failure. The cause is typically a bacterial infection and less commonly a fungal infection. Risk factors include valvular heart disease including rheumatic disease, congenital heart disease, artificial valves, hemodialysis, intravenous drug use, and electronic pacemakers. The bacterial most commonly involved are streptococci or staphylococci. Diagnosis is suspected based on symptoms and supported by blood cultures or ultrasound. The usefulness of antibiotics following dental procedures for prevention is unclear. Some recommend them in those at high risk. Treatment is generally with intravenous antibiotics. The choice of antibiotics is based on the blood cultures. Occasionally heart surgery is required. Nonbacterial thrombotic endocarditis (NBTE) is most commonly found on previously undamaged valves. As opposed to infective endocarditis, the vegetations in NBTE are small, sterile, and tend to aggregate along the edges of the valve or the cusps. Also unlike infective endocarditis, NBTE does not cause an inflammation response from the body. NBTE usually occurs during a hypercoagulable state such as system-wide bacterial infection, or pregnancy, though it is also sometimes seen in patients with venous catheters. NBTE may also occur in patients with cancers, particularly mucinous adenocarcinoma where Trousseau syndrome can be encountered. Typically NBTE does not cause many problems on its own, but parts of the vegetations may break off and embolize to the heart or brain, or they may serve as a focus where bacteria can lodge, thus causing infective endocarditis. Another form of sterile endocarditis is termed Libman–Sacks endocarditis; this form occurs more often in patients with lupus erythematosus and is thought to be due to the deposition of immune complexes. Like NBTE, Libman-Sacks endocarditis involves small vegetations, while infective endocarditis is composed of large vegetations. These immune complexes precipitate an inflammation reaction, which helps to differentiate it from NBTE. Also unlike NBTE, Libman-Sacks endocarditis does not seem to have a preferred location of deposition and may form on the undersurfaces of the valves or even on the endocardium. ^ Kasper DL, Braunwald E, Fauci AS, Hauser S, Longo DL, Jameson JL (May 2005). Harrison's Principles of Internal Medicine. McGraw-Hill. pp. 731–40. ISBN 0-07-139140-1. OCLC 54501403. ^ a b c d e f g h i j Mitchell RS, Kumar V, Robbins SL, Abbas AK, Fausto N (2007). Robbins Basic Pathology (8th ed.). Saunders/Elsevier. pp. 406–8. ISBN 1-4160-2973-7. ^ a b c d e f g h i j k l "Infective Endocarditis - Cardiovascular Disorders". Merck Manuals Professional Edition. September 2017. Retrieved 11 December 2017. ^ Njuguna, B; Gardner, A; Karwa, R; Delahaye, F (February 2017). "Infective Endocarditis in Low- and Middle-Income Countries". Cardiology clinics. 35 (1): 153–163. doi:10.1016/j.ccl.2016.08.011. PMID 27886786. ^ a b c d Ambrosioni, J; Hernandez-Meneses, M; Téllez, A; Pericàs, J; Falces, C; Tolosana, JM; Vidal, B; Almela, M; Quintana, E; Llopis, J; Moreno, A; Miro, JM; Hospital Clinic Infective Endocarditis, Investigators (May 2017). "The Changing Epidemiology of Infective Endocarditis in the Twenty-First Century". Current infectious disease reports. 19 (5): 21. doi:10.1007/s11908-017-0574-9. PMID 28401448. ^ Cahill, TJ; Harrison, JL; Jewell, P; Onakpoya, I; Chambers, JB; Dayer, M; Lockhart, P; Roberts, N; Shanson, D; Thornhill, M; Heneghan, CJ; Prendergast, BD (June 2017). "Antibiotic prophylaxis for infective endocarditis: a systematic review and meta-analysis". Heart. 103 (12): 937–944. doi:10.1136/heartjnl-2015-309102. PMID 28213367. Tissières P, Gervaix A, Beghetti M, Jaeggi ET (2003). "Value and limitations of the von Reyn, Duke, and modified Duke criteria for the diagnosis of infective endocarditis in children". Pediatrics. 112 (6 Pt 1): e467. PMID 14654647. Meine TJ, Nettles RE, Anderson DJ, Cabell CH, Corey GR, Sexton DJ, Wang A (2001). "Cardiac conduction abnormalities in endocarditis defined by the Duke criteria". American Heart Journal. 142 (2): 280–5. doi:10.1067/mhj.2001.116964. PMID 11479467.